You would have to be living under a rock not to notice that florals are all the rage this season. Not that florals ever go out of style, but they do go up and down in the trends. Right now you can wear florals not only in dresses and tops, but also in pants, shoes, shorts…you name it. 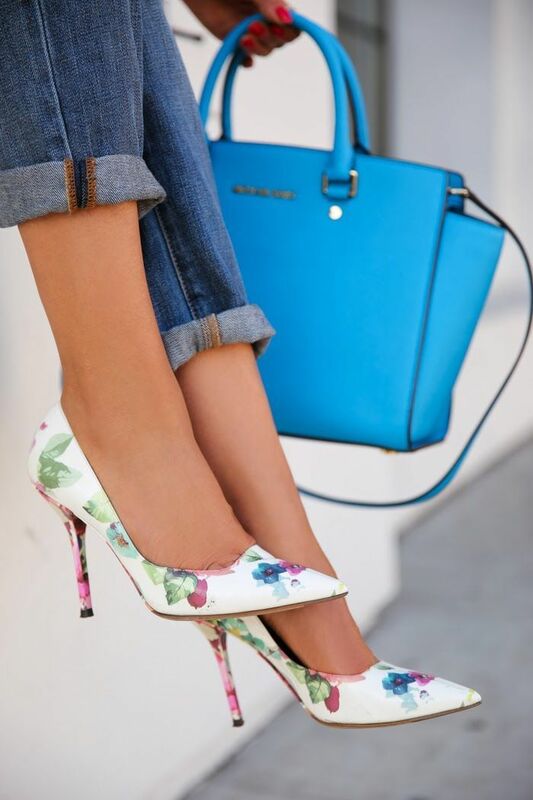 I've been looking for a new pair of floral heels in my price range, but haven't found any yet. Now I'm a flower gardener, so I love flowers. But I prefer to see them more in my garden than on my body. Floral prints usually remind me of youth…little girls in pretty dresses, or young ladies in romantic, frilly garments. Now you all should know by now I don't believe in fashion rules or age appropriate dressing, however, if I put on any garment that's too frilly looking (a.k.a. florals), I feel uncomfortable for some reason. I can't explain it, but it just doesn't seem 'right for me'. So then the question is, how do I incorporate the floral trend into 'my style', so that I feel comfortable in my own skin? One way I do it is to include it in small doses, like in a floral bag or shoes. Another way is to edge it up a bit by adding a more masculine piece. For today's outfit, I am wearing a floral top from J.C. Penney (none left in my size, but the Plus sizes are still available HERE). You may have previously seen this top in THIS POST, where I wore it with a sweater and scarf to my son's graduation. Here I had my personal stylist, my daughter Ashley, style the top with a light wash Levi Trucker Style denim jacket, cantaloupe colored denim skinny jeans, and striped loafers. Because the floral is in one small dose (just in the top), and paired with a masculine element (the trucker style denim jacket), it doesn't overwhelm me and make me feel uncomfortable. It's just the perfect blend of masculine and feminine and just the right amount of floral for my comfort zone. I never would have dreamed of pairing this top with these colored jeans, but Ashley said "The color is in the top, so why not?" I really liked how this outfit turned out. Thanks Ashley! Ashley added turquoise colored jewelry to pick up the turquoise color in the top. I chose the loafers to complete the outfit because I liked pairing a stripe with the florals, and I also felt the loafer style kept the outfit casual. Florals usually always appear more dressy, and wearing casual loafers toned the formality down a bit. I also felt the color in the stripe matched the color in the denim jacket very well too! 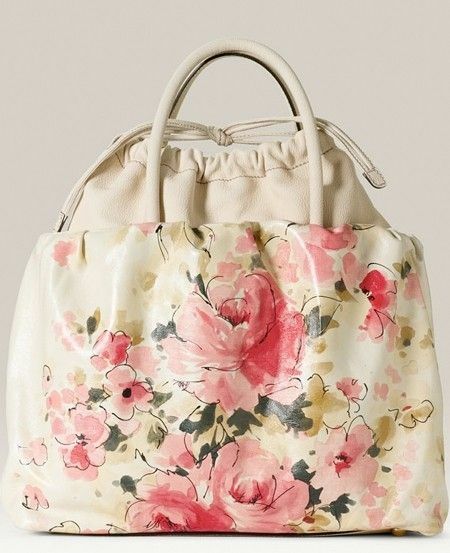 Gotta love this gorgeous floral handbag! 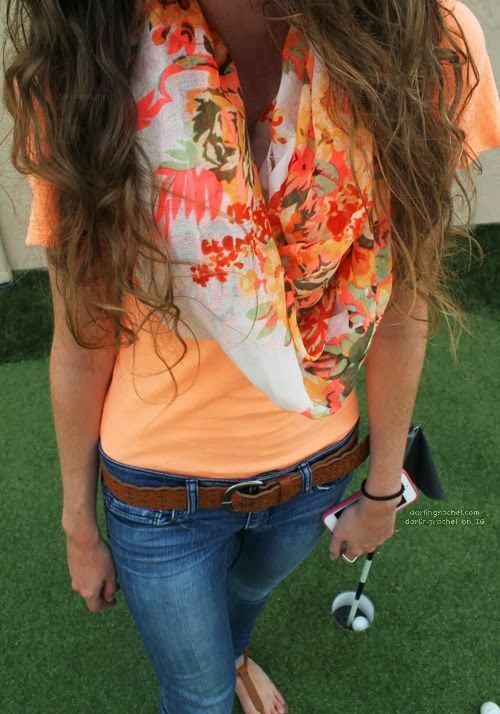 One of my favorite ways to wear floral….in a scarf! Pair floral pants with a dark, masculine style shirt. Edge up a pretty floral skirt with a graphic tee shirt! I want these shoes and I want them now! Gorgeous! So what about you? 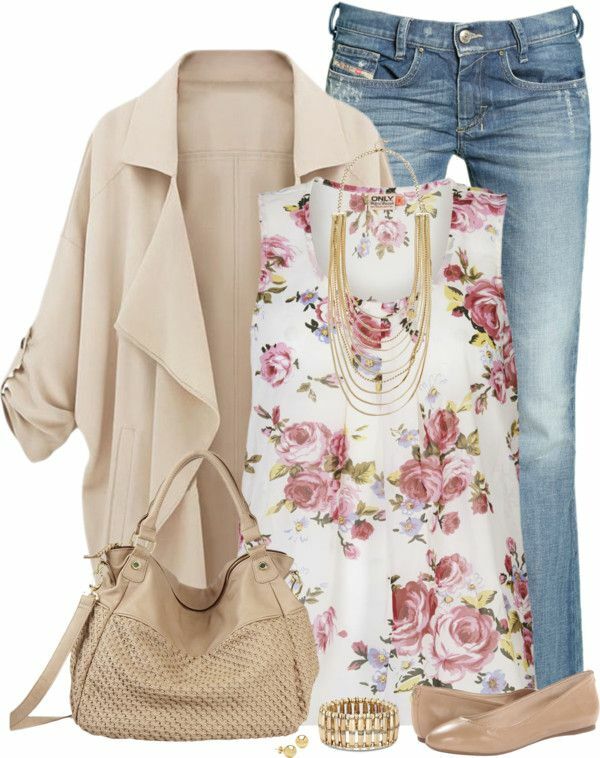 Do you like to wear florals? If so, how do you incorporate into your personal style? I'd love to hear from you! Linking Up With: Passion 4 Fashion, Budget Babes, Charming Friday, Favorite Fashion Friday, Mix it Up Friday, and Fashion Should Be Fun. Great re-creation of that first outfit. 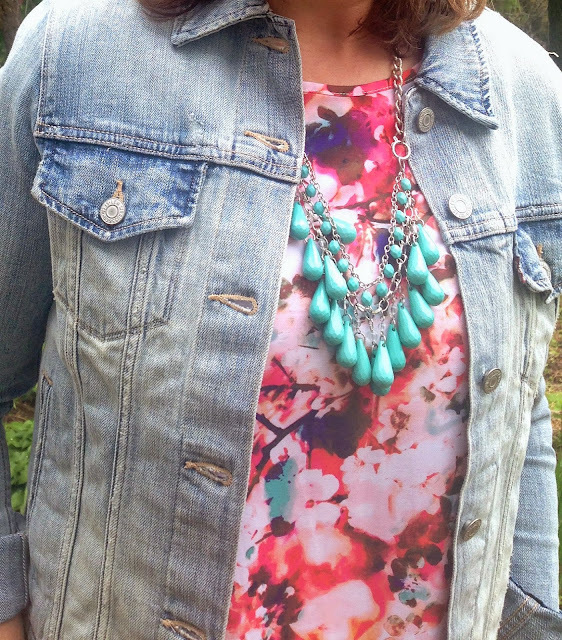 Love that gorgeous floral top and the turquoise necklace with it. Thanks for linking up with Rachel and I today. This is a great Spring outfit, Amy. You look lovely, Amy! I am with you on this one - florals are just not my thing. However, I am trying to be more open minded and incorporate them in small doses here and there. Thanks for linking up with Charming Friday and have a wonderful holiday weekend! I found your blog thru Classy Yet Trendy's linkup party. I never thought about that in some people's head is that one should not wear florals over 50. You showed great examples that are very classy and wearable at any age. Love your outfit here Amy and love all the floral Pin-spiration you shared! So many great ideas. I do not typically do florals - but I love how you styled this. It is a little bit floral - but not overwhelming - and perfect with the trucker jacket and colored jeans. First time here and you could of fooled me about your age ;-) Opposite from you, I always thought floral to be for the older generations, but I agree... fashion shouldn't have age group. There are always ways to change things around to fit you. I personally love how you have fit floral to your outfit! The color jeans was an added bonus! Loving florals right now! Thanks so much for sharing with Fun Fashion Friday!